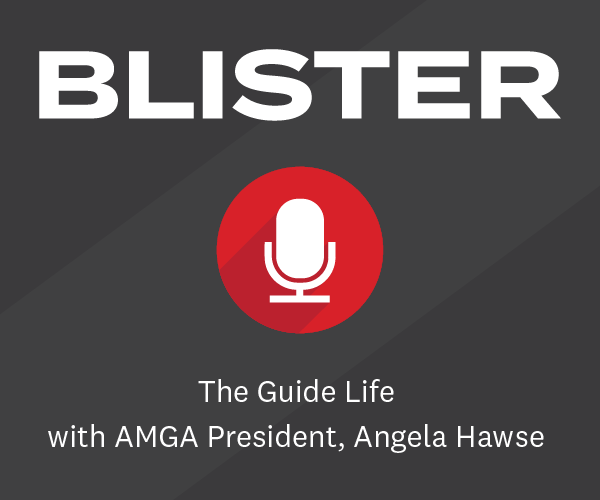 We are on the cusp of a significant paradigm shift in insulation. Manufacturers are slowly moving away from non-breathable down insulation (i.e., puffy jackets), and are instead creating new technologies that insulate while also remaining highly breathable. The Ascendant Hoody by Outdoor Research uses one of the most promising new insulation technologies, Polartec Alpha Direct. Alpha Direct is a synthetic low-density knit fabric, and not a traditional insulation filling (or “batting”) like that found in the Ascendant’s primary competitor, the Patagonia Nano Air). Alpha Direct is very similar to other hi-loft versions of Polartec Thermal Pro, which we at Blister have all been huge fans of. The Outdoor Research Ascendant Hoody that I’ve been testing combines Alpha Direct with a lightweight Pertex Microlight shell to keep out some of the elements, yielding a very warm, breathable, and versatile insulator. The most important part of this jacket is the Alpha Direct insulation, the heart and soul of the piece. It’s kind of like a messier version of Polartec High Loft — it looks a bit nappier, a bit less dense, a bit less refined. That’s not to say that Alpha Direct isn’t refined, just that it was not designed to be visually appealing like High Loft was. This Alpha Direct layer is basically draped as a lining in the jacket, and is sewn into the shell at the major seams. There are small pieces of Pertex on the inside of the arms to make sure you don’t catch fingers in the loft when you put it on, but otherwise, the Alpha Direct is just a fuzzy lining to the Pertex shell. The insulation feels decent on the skin. True to the “messy” look, it isn’t quite as soft and cozy as High Loft. However, it does feel like it will be more durable, as High Loft’s supple nature makes it feel a bit fragile. My primary and biggest issue with the Alpha Direct insulation, though, is the way it feels when it gets wet. The insulation is clearly quite hydrophobic — water likes to bead up on the surface rather than soaking into the fibers. This is great for retaining loft when wet, but not great for comfort. Because the water likes to bead up on the surface, if the insulation gets wet, it feels wet. All the water that is in the insulation is accessible on the outside to the touch — eww. This really isn’t a performance issue on its own, just a bit weird and annoying. In addition, because the water likes to bead, it leads to longer dry times. When water beads up, it likes to be round, minimizing its surface area to volume ratio. Unfortunately, this makes drying quite slow as surface area is the place water evaporates from. The Ascendant dries slowly compared to other fleecy mid layers and base layers I use. The shell fabric on the Ascendant is a lightweight Pertex Quantum that is designed to block some wind and precipitation while allowing the jacket to still breathe well. It has a fairly soft hand feel, and isn’t too loud (though not as quiet as the Patagonia Nano Air). Sam Shaheen in the Outdoor Research Ascendant Hoody. The Pertex shell has a DWR coating and thin acrylic backer. The DWR does the job of repelling light precip, while the acrylic backer provides some durability assistance and a bit of weather protection. The Ascendant does block enough wind and precip to act as a fair (albeit, cold) weather outer layer. In light to moderate winds, the shell cuts most of the breeze, and the DWR can stand up well to brief snow squalls. I still always bring an emergency shell when I use this piece as an outer layer, but if the weather stays on the good side of bad, the emergency shell stays in my pack. This is the big question: How well does the Polartec Alpha Direct insulation actually breathe? And the answer is, quite well. Overall I have been very impressed by the breathability of this piece. 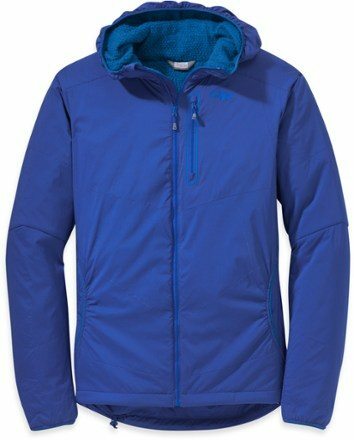 I would say the Ascendant breathes similarly to The North Face Dolomiti (my go-to mid layer) or slightly less than the Patagonia R1. And that’s high praise for an insulator. Without having enough time in the Patagonia Nano Air, I can’t say how well the Ascendant breathes in comparison, but I will say that I doubt that the Nano Air breathes much better. The Ascendant is super warm for the amount of loft it has. I think we have all become accustomed to using the loft-to-warmth ratio of puffy down as a metric for how warm a piece is. However, the Ascendant is significantly warmer than a comparably-lofted down piece. As a mid layer, I would place the Ascendant in a similar realm as most mid-weight down pieces for warmth. Under a shell, it’s warmer than the Patagonia Nano Puff and similar to the Patagonia Down Sweater or Nano Air. As an outer layer, the Ascendant is a touch cooler than as a mid layer because of its significant breathability, which is definitely something to keep in mind. For me, this makes the Ascendant the right weight to wear on chilly days around town; as a 30-40° F belay jacket; or as a very cold-weather layering piece while skiing. For touring and mild-weather skiing, the Ascendant is just too warm for me. 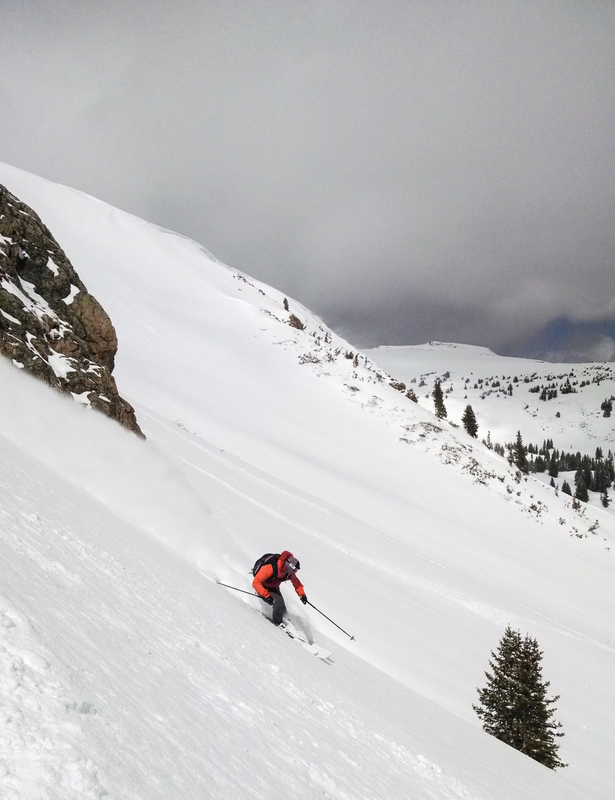 I can wear the Ascendant for lower-output skiing (lift served or casual touring) during mid-winter, but otherwise, I’m reaching for lighter weight mid layers. Sam Shaheen using the Outdoor Research Ascendant Hoody as a mid layer. One of my favorite things about the Ascendant is the fit. It has a slim, athletic fit that is trim while still allowing room for a thin layer or two underneath. The arms are a good length for my average frame, and the torso length is just about right. If you have a larger build, you may find the shoulders and chest to be a bit tight. For a high-performance piece, the size Medium comes in at about the current industry standard when it comes to fit. No surprises here. The Ascendant features open, hoody-style hand-warming pockets without any closure mechanism (zips, snaps, etc). For warming one’s hands, the pockets work great. They are insulated on both sides (making them very warm) and the Alpha Direct material is nice and soft on the hands. 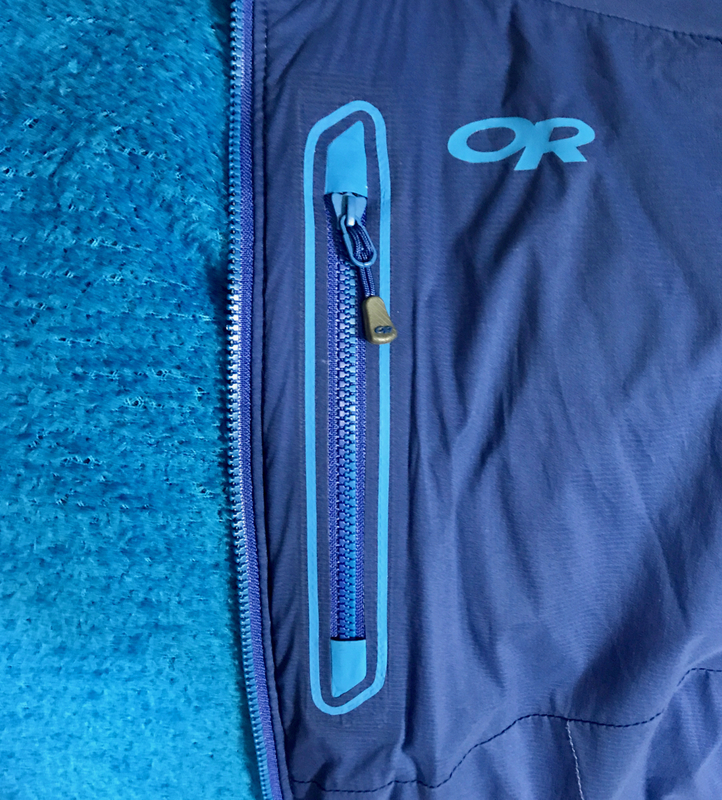 The jacket also features a zip Napoleon pocket (with a rather garish screen print around the zipper). The pocket is exactly what we’ve come to expect — it’s big enough for a smartphone and not much else. The hood is adjustable by a single drawcord in the back. It’s large enough to fit over a mountaineering helmet, but a bit small to fit over larger ski helmets. The hem is adjusted with a single drawcord that is not centered in the back. This isn’t a big deal, it just means that you need to adjust it so that you get even tension on both sides, since just pulling the cord lock will result in an asymmetric cinch. 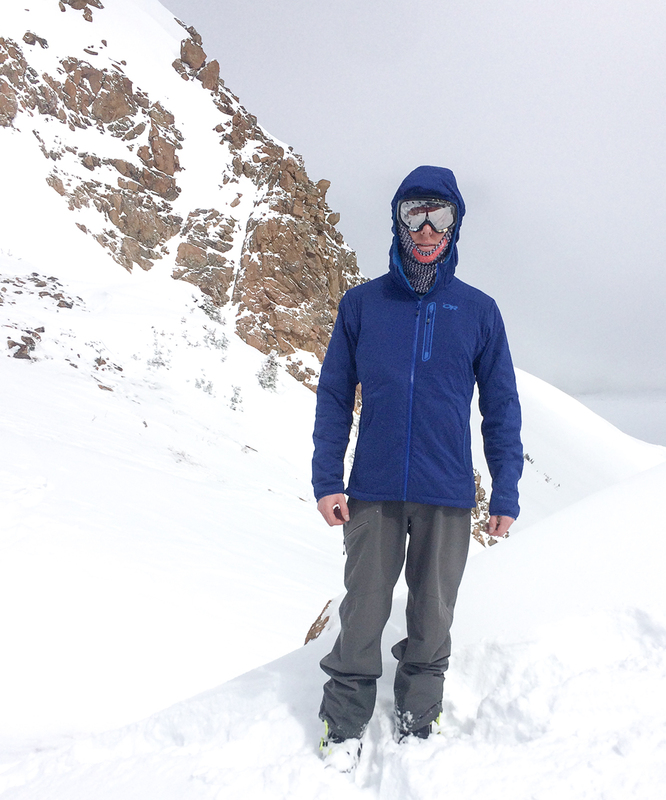 The Outdoor Research Ascendant Hoody puts Polartec’s new Alpha Direct insulation to great use. 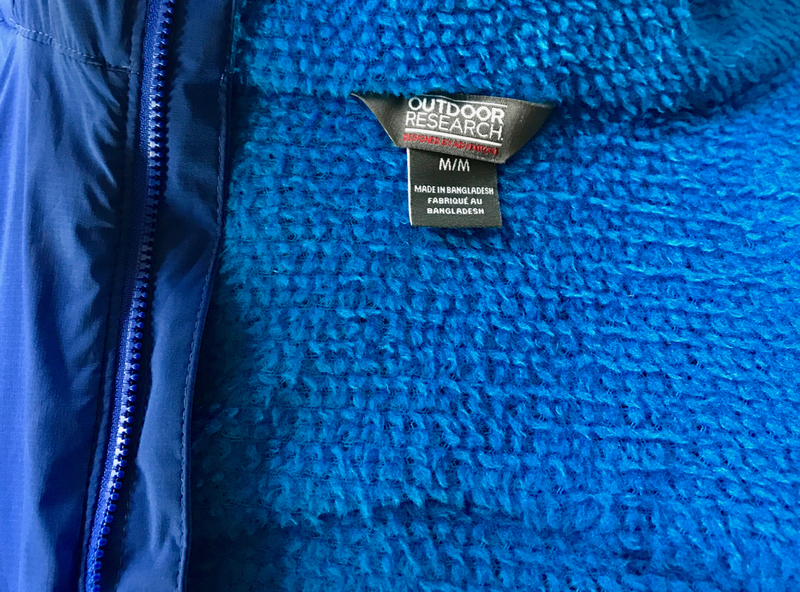 The breathability of this jacket is surprisingly good, and I have been very impressed with the performance of Alpha Direct. Besides an annoying wet feeling to the insulation and slightly perplexing hand warming pockets, the Ascendant is a solid choice for cold-weather, breathable insulation. Can you guys make a direct comparison to the Nano Air? That would be interesting! Hey Bredey, I’ll be making direct comparisons the Nano Air Light Hoody when I put up my second look on that piece in the next few weeks. Arc’s Proton LT and AR are also similar jackets. I have the latter and have liked it so far. I would like to see a comprehensible article on all of these active insulation jackets, as they really seem to be game-changers. Yep, agreed. The Proton jackets look great and we hope to get time in them soon! Hey B Kim, I think the Ascendant is a good choice to replace the Atom LT, it will certainly be a bit more breathable. I would also check out The North Face Ventrix and the Patagonia Nano Air. Each one has a slightly different feature set and fit. Find one that works best for you!